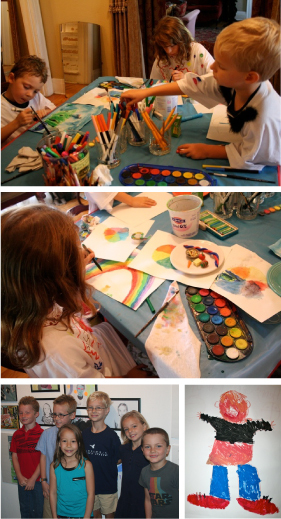 Gianna is a free, interactive art class for kids between the ages of 6 and 12. Students will learn a variety of different art techniques and work in several media, including photography, portraiture, sculpture, and painting, while an instructor discusses the artists who popularized that media or technique. In one class, for example, students might build a mobile while the instructor discusses the work of artist Alexander Calder. There are no grades or evaluations; the Gianna philosophy is that everyone is an artist. The sixth and final Gianna session is a gallery show, held at R. Pela Contemporary Art, where the Gianna students will display their art for friends and family to see. Gianna is taught by Robrt Pela, a local writer, and by guest instructors, including public school art teachers and well-known Phoenix visual artists. Gianna takes place one Saturday per month, from 10:30 a.m. until 12 noon, at R. Pela Contemporary Art, 335 West McDowell Road in Phoenix. A parent or other adult should accompany students to the first Gianna session; at subsequent sessions, parents may drop students off and return at noon, or can choose to stay for the whole class with their child. Because the Gianna class instruction is progressive—we’ll use ideas and materials from the month before in each subsequent session—it’s important that each student attend all six Gianna sessions.